That’s what friends are for! 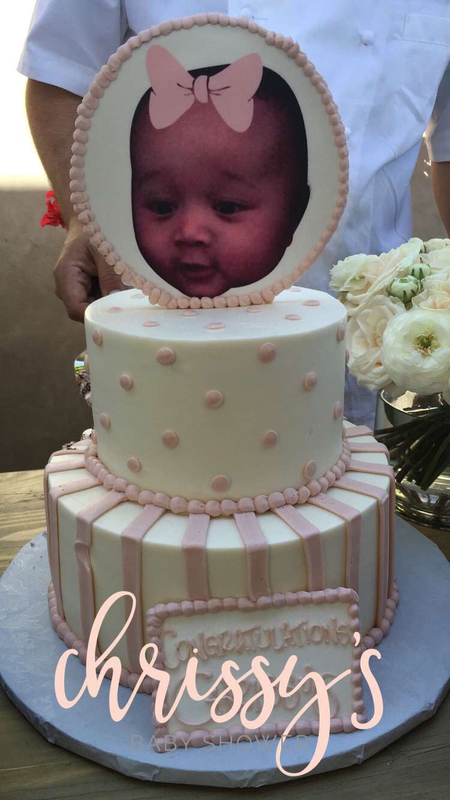 Kim Kardashian threw a lavish baby shower at her house for her BFF Chrissy Teigen on Saturday, March 26. The star-studded guest list included the supermodel&apos;s pals Khloé Kardashian, Kourtney Kardashian, Jenna Dewan Tatum, Minka Kelly and Erin Andrews. The A-listers celebrated in style in Kim’s backyard, which was decorated with huge arrangements of white flowers, while sitting at a long table. The baby shower planned by Corrie Mendes had a high-low theme, with a combination of extravagant, expensive decorations and cheap fast food, including McDonald’s All Day Breakfast and chips and nacho cheese dip. The Kardashian sisters even posted a series of photos and videos on Snapchat of them eating McDonald&apos;s World Famous Fries before the party kicked off! During the party, guests played a nursery rhyme–themed game and Khloé made a speech. They also had a mini–dance party in the kitchen. Teigen&apos;s husband, John Legend, later joined them. Mendes tells Us that guests also received gift bags containing Teigen&apos;s cookbook, Cravings; La Mer&apos;s The Concentrate; OUAI Treatment Masque; Bisou Body lip potion; and LuMee cell phone cases. The mom-to-be, 30, posted a sweet note from her niece Makenzie on Instagram in the hours before the shower. “I hop you hav the best tom wit oot me,” the tot scribbled on a piece of paper. “‘I hope you have the best time without me’ – my niece Makenzie writing me passive aggressive letters!” Teigen captioned the adorable pic. "I hope you have the best time without me" – my niece Makenzie writing me passive aggressive letters! ??? Teigen and Legend, who tied the knot in 2013, are expecting their first child (a baby girl!) next month. They selected the baby’s gender through in vitro fertilization.